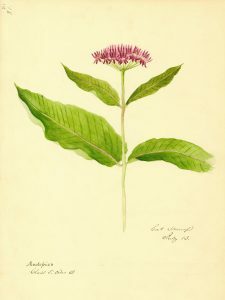 Wôpanâôt8âôk, pronounced, womp a naa on too aah onk, has been referred to by various names throughout history such as Natick, Wôpanâak, Massachusett, Wampanoag, Massachusee and Coweeset, as well as others. The language is but one in some forty languages that comprise the Algonquian language family–the largest geographical distribution of languages in the Western Hemisphere. The first Bible produced on a printing press in North America was printed in Wôpanâôt8âôk in 1663 on the printing press at Harvard University. 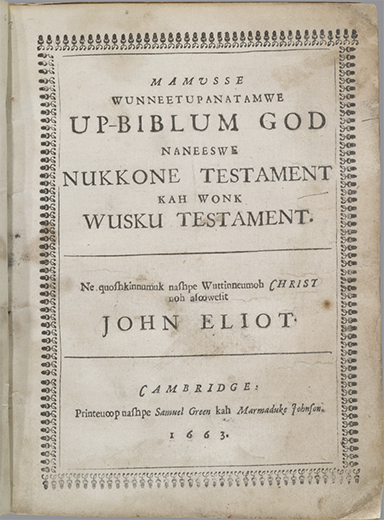 Today this Bible, as well as all of the other documents in the language, are the foundation of the Wampanoag language work that has earned critical acclaim through the Makepeace Productions film “We Still Live Here: Âs Nutayuneân,” and the work of Wôpanâak Language Reclamation Project, a 501c3 nonprofit organization founded in 1993 and governed by four tribes of the Wampanoag Nation (Mashpee, Herring Pond, Gay Head Aquinnah, and Assonet Band). The bible currently on view was owned by Roger Williams, Protestant theologian who established the colony of Rhode Island in 1636. This exhibit by ethnomusicology Ph.D. candidate Byrd McDaniel displays some of the memorabilia central to air guitar playing in the United States and the U.S. Air Guitar Championships in particular. Advertised as the “greatest thing you’ve never seen,” the contemporary U.S. Air Guitar Championships stem from a long line of related practices throughout the twentieth century—such as pantomime, musical comedy, and dance—that crystallized in the late 1970s and early 1980s around air band and air guitar competitions. Byrd argues that we should think of air guitar as a type of listening—a practice in animating, translating, and transmitting rock recordings. Air guitar competitions not only reproduce and revisit some of the classic moments in rock guitar history, but they also revise these moments, sometimes sustaining and sometimes challenging the often racist, sexist, and ableist narratives that litter the genre’s history. It can also undermine these problematic discourses as well, subordinating guitar greats and lofty values (like authenticity or virtuosity) to the tastes and talents of the amateur air guitarist. Ultimately, air guitar playing reminds us how gesture and listening sustain important aspects of our cultural identities. It calls on us to rethink the origins of our current interactive and haptic technologies, which stem just as much from technological innovations as they do from a desire to take music recordings into our own hands. This colorful Folklore Music Map of the United States contains period illustrations, musical classifications and a bibliography. With its visual overlay of music and geography, the map provides useful information about the varied and unique sounds produced nationally and studied by folklorists of the 1940s. 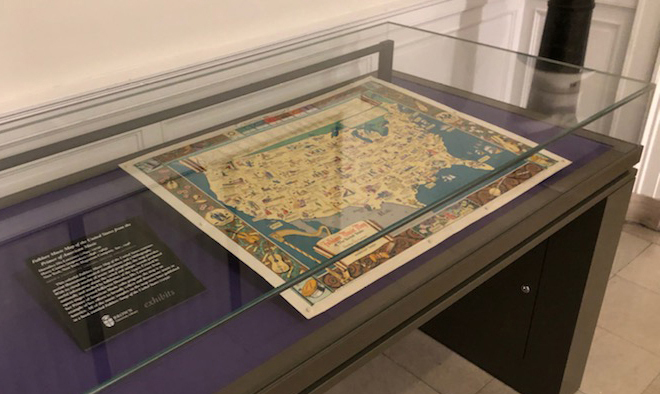 Created by opera singer turned folklorist Dorothea Dix Lawrence from her Primer of American Music radio program, the map is an example of her efforts to broadly collect and disseminate music in America. All of the music samples on the map were later published in a book entitled Folklore-Songs of the United States (1959). 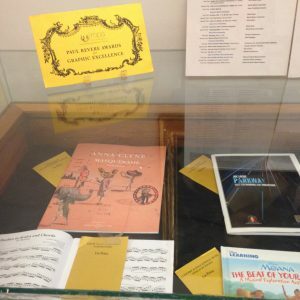 The Orwig Music Library is hosting a traveling exhibit: Winners of the Paul Revere Awards for Graphic Excellence, awarded by the Music Publishers Association of the United States. The MPA gives prizes in several categories of music publishing, including different types of notesetting, design in folios, and cover design. 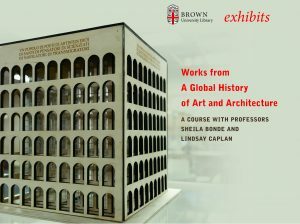 Examine models and artwork created by students in Sheila Bonde’s and Lindsay Caplan’s lecture course, “A Global History of Art and Architecture”, which presents art, architecture, and material culture from cave paintings to installation art. The works exemplify forms studied in the class. Curated by Rhodes Scholar Rhea Stark ‘18.5. From where exactly do the Islamic arts originate is the question at the center of this exhibition. While the answer perhaps seems intuitive— the Islamic Middle East—the reality is far more complex. The Islamic arts have from their beginnings existed in circulation and conversation with an array of work originating in China, India, and Europe. 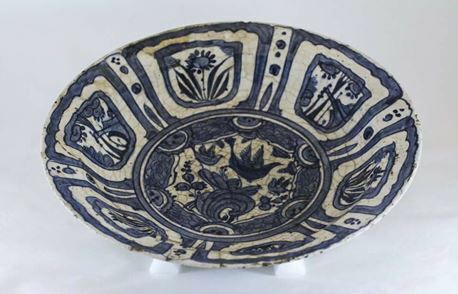 Explore Iranian ceramics from the Joukowsky Institute of Archaeology’s Minassian Collection and learn about their transcultural aesthetic references. Martina Rugiadi, Associate Curator of Islamic Art, Metropolitan Museum of Art will explore the historical techniques and trading practices of Iranian ceramics. Please join us for the talk and Q&A. The lecture and exhibit are free and open to the public. 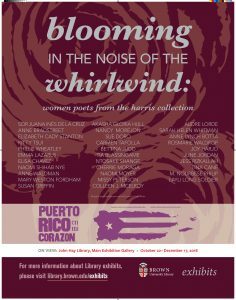 Lecture Time: 5 – 6:30 p.m.
Blooming in the Noise of the Whirlwind & Puerto Rico en mi corazón on view at John Hay Library, exhibition gallery. 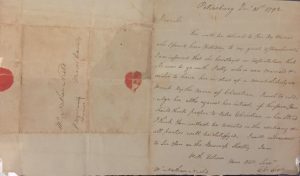 This exhibition focuses on a small selection of the many extraordinary women poets represented in the Harris Collection of American Poetry and Plays. From women writing in the colonial period, to nineteenth-century working-class women documenting their everyday lives, to young activists writing in the aftermath of the 2016 election, through four centuries these poets have all used their work to celebrate their identity, express desire or anger, preserve memory, and amplify a message. Puerto Rico en mi corazón is an anthology collecting forty-five contemporary Puerto Rican poets, both emerging and established, writing in both English and Spanish, living both on la isla and in the diaspora, afro-boricua, white, mixed, indigenx and of all genders. 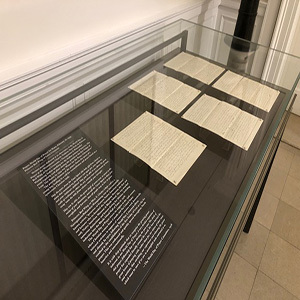 Organized by poet, printer and Brown faculty member Erica Mena, the fifteen displayed bilingual broadsides demonstrate collaborations between poets, translators and letterpress printers across the continental United States. The item on display is a written prayer delivered at an observance of the World Day of Prayer at the Westminster Church, Yonkers, New York, by Princess Red Wing of Seven Crescents, a Narragansett and Pokanoket Wampanoag Indian, speaking on behalf of the Indian women of America. The principal element of the prayer charts the quest of a young boy and leads to a call for reconciliation and peace based on a syncretistic Christian faith. Princess Red Wing, or Mary E. Glasko (1896–1987), was an internationally known activist, “preserver of Eastern Native American traditions,” and lecturer who co-founded the Tomaquag Museum, the first and only Native American Museum in Rhode Island. She was awarded numerous distinctions and honors during her lifetime, including induction into the Rhode Island Hall of Fame in 1978. On Monday, November 19, 2018 from 12 – 1 p.m. in the Digital Scholarship Lab at the Rockefeller Library, Lorén Spears (Narragansett), Executive Director of Tomaquag Museum, will discuss the life and legacy of Princess Red Wing who was, in addition to being a Narragansett/Wampanoag leader, a culture bearer, author, and educator. Please join us for the talk and Q&A, we also invite you to view the exhibit across the street at the John Hay Library. The lecture and exhibit are free and open to the public. Lecture Time: 12 – 1 p.m.